Breakfast daily, Lunch Sat.-Sun., Dinner Fri.-Sat. 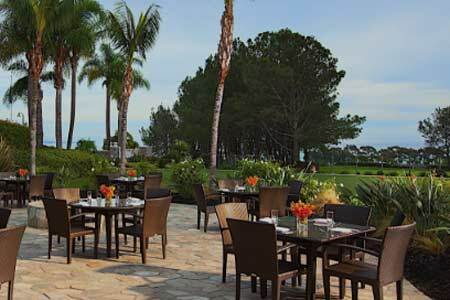 : VUE overlooks Dana Point Harbor at its Laguna Cliffs Resort & Spa locale. This contemporary restaurant creates a comfortable vibe with down-to-earth brown tones, black-marble tables, mirrored booths and low lighting. At breakfast, guests may order American-style egg dishes, hearty traditional items or opt for the buffet. Lunch is available Saturday and Sunday and dinner is served Friday and Saturday only. Start things off with a small plate of crab cakes complemented by almond romesco aïoli. Sandwiches like the pastrami Reuben are ideal for lunch or lighter fare. Mains such as Scottish salmon with curry quinoa and braised short rib with lobster risotto allow the kitchen to add a touch of classic sophistication. For dessert, don’t miss the chocolate pot de crème and the ginger cake topped with house-made vanilla ice cream. The wine list is a well-chosen mix of old-world and new-world selections. Service is professional, with an experienced maître d’ who also acts as a sommelier.